NILES, OH - The Mahoning Valley Scrappers are proud to announce a jam-packed promotional schedule for the 21st season at Eastwood Field. 2019 season highlights include seven post-game firework displays, four full-sized bobblehead giveaways, five Buck Nights, including the Fourth of July, and three specialty jersery nights. The Scrappers full-sized bobbleheads presented by 21 WFMJ will feature three former Scrappers: Michael Brantley on Saturday, June 29 (presented by Toyota of Warren), Shane Bieber on Friday, August 9 (presented by Auto Owners Insurance; Paige & Byrnes, Daubenmire Insurance and Tom Uher at Champion Insurance of Austintown), and Jesus Aguilar on Saturday, August 17 (presented by Western Reserve Orthotics and Prosthetics Centre). Additionally, everyone's favorite mascot, Scrappy will round out the bobbleheads on Saturday, July 6 (presented by Eastwood Mall Complex). The other giveaway night includes a Youth Fauxback Jersey on Saturday, June 22 (presented by Armstrong). The Scrappers will wear three specialty jerseys this season that will be auctioned off at the games and through the free app LiveSource. Specialty jerseys will be worn on Friday, June 21, Saturday, July 13 and Saturday, August 10. Details including designs will be revealed soon. Every Monday Matters (presented by Pizza Joe's) at Eastwood Field. Bring a donation of a non-perishable food item, new or gently used clothing item or a children's book for a free General Admission ticket. Tuesdays are All You Can Eat! Get all you can eat hot dogs, burgers, soft tacos, nachos, French fries, popcorn and fountain drinks through the 7th inning. Fans can purchase the All You Can Eat pass for an additional $15 per person or an additional $12 per child, 12 and under. All our 55+ fans will receive half off Upper Box tickets for Senior Discount Tuesdays (presented by Shepherd of the Valley). Tickets must be purchased at the Chevy All Stars Box Office. Wednesdays are Military Appreciation Nights (presented by NECA/IBEW Electrians). Show your Military I.D. at the Chevy All Stars Box Office at Eastwood Field for two free Upper Box Seat game tickets. It's also Wendy's®Wednesday. Fans can receive buy one get one free Upper Box Seat tickets with a Wendy's receipt or voucher from participating Wendy's. Thursday Buck Nights (presented by Quaker Steak & Lube) are back! Fans can enjoy $1 General Admission tickets, hot dogs, and drinks at five Buck Nights this season. Each Friday home game there will be a fantastic fireworks show! Fireworks will also follow the game on the Fourth of July (presented by McDonald's). Fireworks are presented by media partner 21 WFMJ & WBCB. Sundays are Family Fun Days (presented by McDonald's) featuring kids' themed activities all game long. It's also the Ohio Lottery Second Chance Sundays Promotion - buy one get one free tickets with any non-winning Ohio Lottery instant ticket. 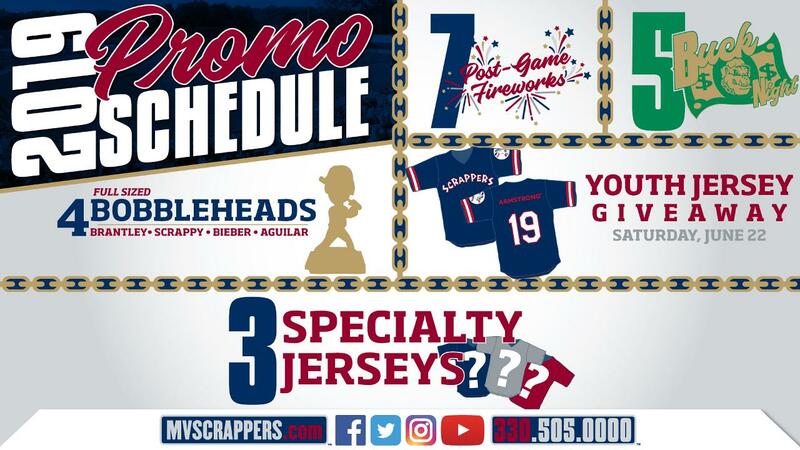 For a complete promotional schedule, visit mvscrappers.com. The Scrappers open the 2019 season at Eastwood Field on June 16 vs the Batavia Muckdogs. Single game tickets are on sale now and can be purchased online at mvscrappers.com, at the Chevy All Stars Box Office at Eastwood Field or by calling (330) 505-0000.